use the link at the end of this letter to un-register. The "NewsReporter" is published to keep you up-to-date on the latest information we gather for avoiding and surviving the hectic hacker attacks on your computer security and personal identity that take place constantly on the internet. Many of our comments are based on personal experiences. Protecting your safety, security, sanity, and privacy is not a simple task. We are trying to make it a bit easier for you to accomplish. Virus AdvisoryW32/Sober.p@MM is a Medium Risk virus. Virus AdvisoryW32/Bagle.dldr is a Medium Risk trojan. A hacker has created a virus that targets music lovers by deleting MP3 files on infected computers, according to antivirus company Sophos. The worm, dubbed Nopir.B, spreads over peer-to-peer networks and appears to have originated in France, security researchers at Sophos reported. It's designed to look like a DVD-cracking program, to fool people looking for a program that will circumvent copy-restriction technology on the discs. When the worm is downloaded and run, it attempts to delete all MP3 music files and wipe some programs from the infected PC, Sophos said in its advisory. In its report covering security threats during the first quarter, McAfee's Anti-virus and Vulnerability Emergency Response Team (AVERT) stated that more than 1,000 new attacks aimed at software vulnerabilities emerged in the first three months of this year. The total amounts to a roughly 6 percent increase, compared with the same period last year. McAfee also noted that it received word of more than 200,000 vulnerability-oriented attacks during the first quarter. Here's our usual reminder that you can download a FREE virus checking and removal tool at the Firewalls and Virus Protection site. STINGER checks and removes viruses already in your computer. The program fits neatly on a floppy disc - a perfect way to clean up your computer if a worm or other 'rogueware' has disabled your ability to use your computer to get back on the Internet and update your security ware. This is our Birthday Issue -- The Anniversary of One Year of Publishing the "Security Alert News Reporter"! A review of the past issues demonstrates how much, and yet, how little the cyber jungle has changed. In addition to SPAM and popups, Spyware concerns were beginning to alarm even the most casual users of the Internet, even though the majority of them were uninformed about how to avoid or minimize the threats. One of the biggest problems we recognized then, was that most of the everyday email users, web surfers, etc, did not have the proper software tools to protect their computer security and the more serious threats to their personal identities, nor did they fully understand what they needed. And today, a year later, the purveyors of spam, spyware, malware, adware, and viruses continue fiercely, to dump this stuff on us, with even more sophisticated methods and tools. There's a critical race ongoing between the software safety and security writers and the more sophisticated criminal types to outdo each other. A little over a year ago, many of our family members and friends were telling us about the problems they were experiencing with their computers. They were really unaware of the reasons why their computers were crashing, popups were popping up all over, spam was inundating their mail boxes, and other odd things were happening to them. Virus Grief and Computer Rage often resulted from these frustrations. To help them, and everyone else encountering the same difficulties, the "Firewalls-and Virus-Protection" website was published. A news letter can usually be more current and timely than a website, so the "Security Alert News Reporter" came into existence to alert and advise of the current status of cyber world activities. Subscribers are kept up to date through automatic mailings, which they agree to receive. Now, a year into publishing the "Security Alert News Reporter" finds most of us still facing many of the annoyances and distraction to safe and enjoyable Internet use. Just about all of last year's defenses are actually out of date and ineffective. Being informed is an urgent priority. For the coming year, and for as many more as possible, the thrust and purpose of these publications (including the new Security Alert Blog) will be to inform and guide our friends through the ambushes and traps in the Cyber Jungle. Family Caring - Here's a site I became aware of just recently. It impressed me so much that I'd like others to benefit from the resources posted there, too. At some time in our lives, family members and friends may need caring support and special understanding. There's an outstanding FREE manual published at the Senior2Senior.org website titled "Care Giving/Care Receiving". I urge you to get this valuable document, even if you aren't a Senior or aren't now involved in providing care for a loved one. I've never seen anything so well done. ...and to help parents, grandparents and guardians guide today's young internet surfers to safe sites. There are many other website creators who feel the same concerns and responsibility. These are just a few of their sites that we have personally reviewed and tested as safe for our Grandchildren. Check them out and share them with the young people you care about. If you would like to help support the Code Amber project, please click here. Our Firewalls-and-virus-protection.com website has been Certified 'Family Safe' by the Institute of Family Safe Businesses. A really cool Index to the Web for net Surfers ages 8 - 14. Parents will love this one, too. We receive no compensation for displaying these links and you will be under No Obligation when you visit them. They are here because we care about the safety of everyone who uses the internet, especially our Kids. Works as a stand-alone application or with existing site blocking programs (AOL Parental Controls, Cyber Patrol, Cyber Sitter, Net Nanny, etc. Many people using the internet sometimes wonder if their firewalls and virus protection are good enough to keep them safe. For those of you who have visited our Firewalls website and Security Alert Blog, you know that the information there is directed toward keeping you safe from hacker and cracker attacks. Additions to our bookshelf are selected with the same purpose - and we encourage you to share it freely. Because it isn't always convenient to share your computer with family and friends, we have created small downloadable reports that can easily be printed and distributed to the people you'd like to help avoid 'virus grief'. Protect Yourself and Family from Dangerous Chat Rooms and Instant Messages. If you use them, you and yours are the Hacker's newest targets. Hackers are already taking advantage of problems with today's IM systems. People not familiar with these new threats could easily open a new, harmless looking IM message that pops up on their screen. With one well intentioned click of their mouse on a Hackers phony message, could get infected. In case you missed this FREE report on the Firewalls-and-Virus-Protection website, you can read it here. Please print the report and share it with your family, friends and associates. Help them avoid the hidden dangers and threats often buried in IM messages and of predators lurking in Chat Rooms. Online Security while Traveling in the United States and Abroad. The author, Victor K Pryles, discusses computer security and offers first hand advice on maintaining personal safety while on the road, high seas and in the air. Is a Keystroke Logger Being Used To Spy On You? Many of the tools and tricks in use today to spy on your internet activities are exposed in this 7 page report. This look into spyware will alert you to the ease in which your identity could be compromised, or stolen. Are Keystroke Loggers Spying On You? It cost one of our friends a whole lot of money, much aggravation and lost time, lost records, and a major inconvenience to recover from the havoc caused by the worms and viruses that had infiltrated their computer over a period of many months. In case you missed this FREE report on the Firewalls-and-Virus-Protection website, you can read it here. Our friends have recovered full use of their computer and now encourage everyone to learn from their experiences. Please print the report and share it with your family, friends and associates. Visit the Federal Trade Commission (FTC) website with its many publications relating to protecting the security of your family, both on the internet and off. They are FREE. You can go to their pages covering Consumer (family) protection HERE. Free Resources You can easily have the latest Firewall, anti-virus, spam blocking, and spyware removal software installed on your computers. Download all of these programs, and more, mostly for FREE, from our Firewalls-and-Virus-Protection website pages. They're there for the taking. If you need to block Spam, check the links on the 'Spam and Spyware' page. Same thing for Cookie Crumbling tools, Spyware protection, etc. Most of them have a purchasable Up Grade option, and by trying the free versions, you can upgrade the ones that worked best for you. Browser Hijacking hasn't gone away. One of the outstanding sources for information about browser hijackers and tools to remove these predators is available on the SpywareInfo.com/ website. You can download HijackThis from the Software link on the SpywareInfo website. Be sure to read and follow their instructions to the letter if you want good results. We learned about this program from the extraordinary website and forums built and maintained by James Healan, webmaster of SpywareInfo.com. DOWNLOAD latest cws shredder from Softpedia. It'll find and remove those nasty Cool Web Search trojan horses. "Keep Your Private Information PRIVATE"
Lock away all of your Passwords, Images, Documents, Video and Audio into one Encrypted database for your eyes only. 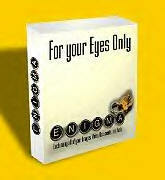 Enigma enables you to Encrypt and store almost anything so that only you can access the files through a master password chosen by you. Of course, all or any of your Encrypted files can be restored to their original state any time you choose. You can even backup and restore the entire database to and from CDs to ensure that you lose nothing even if your hard disk dies. Ever since I found the eBook, "The Hacker's Nightmare" that tells how to really Keep Hackers, Worms and Germs out of my PCs, it has received my highest recommendation to family and friends. keeps spyware from being installed. Bill Hely has designed a webpage that describes many of the security tricks and tools that will help keep that nasty stuff out of your computer. Review The Hacker's Nightmare Story HERE. Some sample (Free) chapters are available to early visitors. "Bill, there is no way I can thank you enough for creating this wonderful program. I have done little else since I got it downloaded than print, read, experiment and learn. You are truly a genius and a very kind person for helping me 1-on-1 with my problem. The information in that book is so all encompassing that it is far more than a book on how to protect a computer. It also gives all the basic information on different concepts from Computer 101 to Advanced. My biggest question is why you are not charging more? All of that information would cost a fortune if it were sold separately. At any rate, thank you again and again!! I would love to be an affiliate as soon as I learn a little more. It would be the only thing I ever sold that I truly believed in. You are incredible!" Operation Web Snare is a coordinated effort targeting an expansive array of Cyber Crime schemes victimizing individuals and industry worldwide. This initiative highlights numerous investigations that have been successfully advanced through coordination of law enforcement, and a growing list of industryand international partners. The development of international resources is closely coordinated with the DOJ, the U.S. State Department and a growing list of E-Commerce industry partners. Criminal schemes included in this initiative include: criminal spam, phishing, spoofed or hijacked accounts, international re-shipping schemes, Cyber-extortion, auction fraud, credit card fraud, Intellectual Property Rights (IPR), Computer Intrusions (hacking), economic espionage (Theft of Trade Secrets), International Money Laundering, Identity Theft, and a growing list of traditional crimes hat continue to migrate on-line. Operation Web Snare has been coordinated at the Federal level with the Department of Justice, the Federal Bureau of Investigation, the Internet Crime Complaint Center (IC3), the U.S. Postal Inspection Service, the U.S. Secret Service, the Federal Trade Commission, and the Bureau of Immigration and Customs Enforcement. Numerous state and local law enforcement agencies contributed significantly to this nitiative as well. Operation Web Snare includes more than 150 investigations, in which more than 870,000 victims lost more than $210 million dollars. Through these investigations more than 300 subjects were targeted, resulting in 100 arrests/convictions, 116 indictments, and the execution of more than 130 search/seizure warrants. Although significant in number, these investigations represent only a fraction of the Cyber crime problem, underscoring not only the need for sustained law enforcement focus, but the continuing development of expanded industry partnerships as well. How many of your IM and Chat Room Buddies are alert to the growing Instant Messaging threats? In case you missed this FREE report on the Firewalls-and-Virus-Protection website, you can read it here. Please print the report and share it with your family, friends and associates. ▪ Are PC users ready for another Operating System? There are dozens more posts available in the Blog Archives. Read our Blog Posts HERE. I urge you to Comment, Challenge and add your own opinions to ours. Please help us help your family, friends, and associates enjoy a safer and less frustrating internet experience. We encourage you to share this information with them or suggest they subscribe to the news letter below. _____________ All of us, too, need to act, by educating ourselves and by making sure we obtain the necessary programs to protect our computers. e-mail; and downloading patches that update software. Send in your questions. There is no such thing as a stupid question. Some people are bashful about asking, but there are always many others who share the same question, and will benefit from the answers to yours. With your permission, we'll publish your questions and answers in future issues of the "NewsReporter". Sharing ? If you had the opportunity to help family members, associates, or friends by sharing any of the information in this "News Reporter", please suggest that they subscribe for their own personal copy. suggest that they review the help that's readily available at this one page summary of the Online Security Consideration and Protective Tactics that are designed to keep them be safe on the Internet. They Can Check out these Considerations and Tactics HERE. To avoid unwanted and unnecessary filtering of our messages, we will send a very brief text email to you. It will have a link to this News Reporter and an un-subscribe link.The email subject line will identify the contents as "Latest Security Alert News Reporter - Issue ##" and the email "FROM" address will be "richard@richardpresents.com"
Have you heard about the i-Cop Coupon Book?